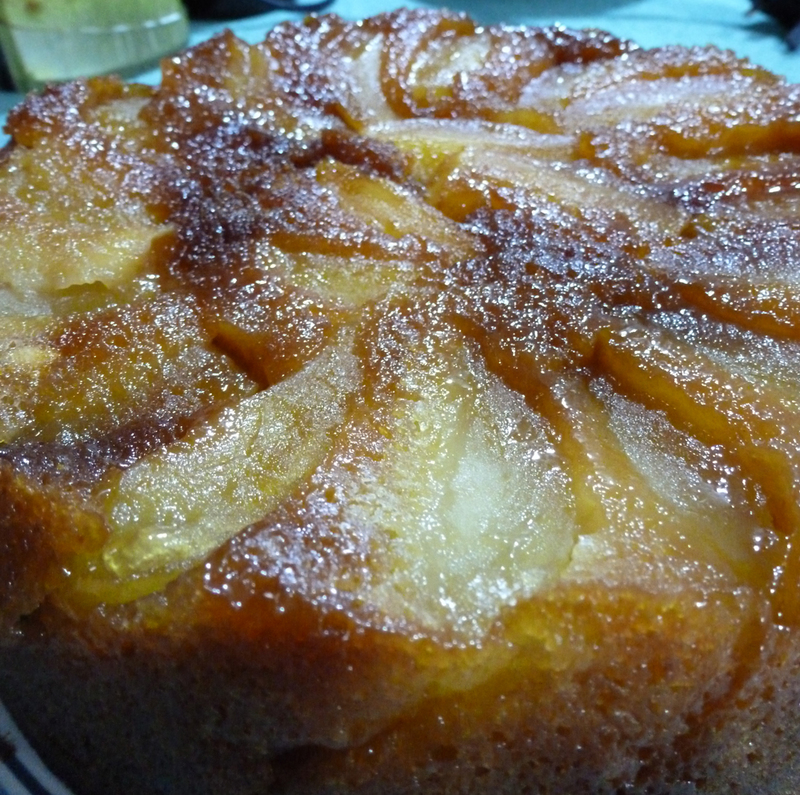 I love tarte tatin. Apples cooked in lovely, caramel sauce on a bed of tender pastry. This is another recipe where the main ingredient is enclosed and allowed to bubble in its own juices, losing nothing. The only problem is turning the thing out! However careful I am I always end up with my neat pattern of apple pieces all slopped over to one side. Or, even worse, still stuck in the tin after the pastry has departed towards the plate. I decided to stick them firmly in place once and for all, and use a cake mixture instead of pastry. It’s more substantial, but shares the appley, caramel deliciousness of a traditional tarte tatin. It works quite well as a moist cake, but is also great served warm with clotted cream and/or custard as a rib-sticking pudding. 5 medium eating apples, peeled, cored and each cut into 8 pieces. Heavily butter and coat with sugar a loose-bottomed or spring form cake tin. Arrange the apple pieces in an attractive pattern in the bottom of the tin. (If you have any pieces you can’t fit in, chop them into small cubes and fold them into the cake mixture). 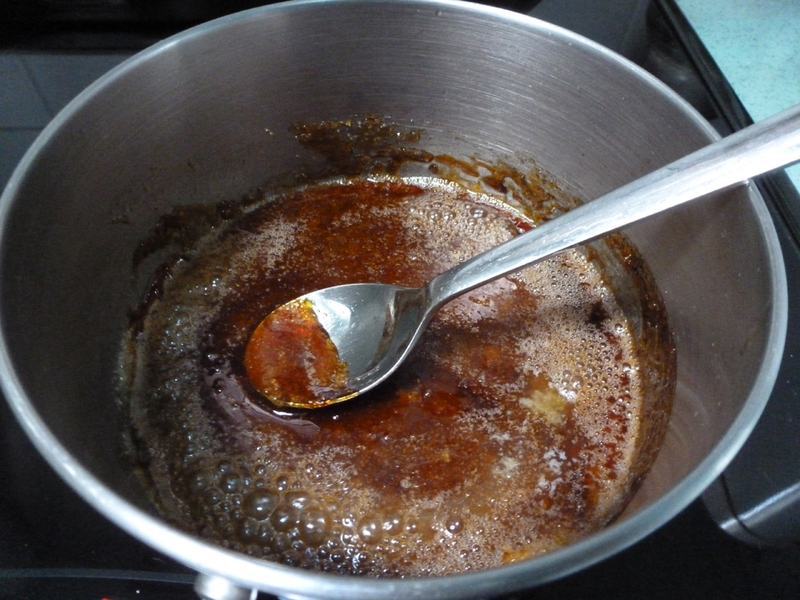 Make the caramel by melting the 3 oz of sugar in a small saucepan. This needs to be done with care! I turn the heat off when the outside edges are dark and starting to smoke (!) and the inner sugar is still uncooked. A good stir and the remaining heat in the pan finishes off the rest. If it’s still darkening rapidly, be ready to lob in the 1 oz of butter, which will cool the caramel down. Some say the caramel should be pale so as not to overpower the apples; I prefer it darker, so there is a definite toffee flavour. This is the colour I like! I've just added the butter, so it's starting to set. Pour (!) the caramel over the apples. I say this with some humour, as you usually find at this stage that it’s set solid in the bottom of the pan! Warm it gently and it will regain some elasticity. Dot it here and there on your apples as best you can. 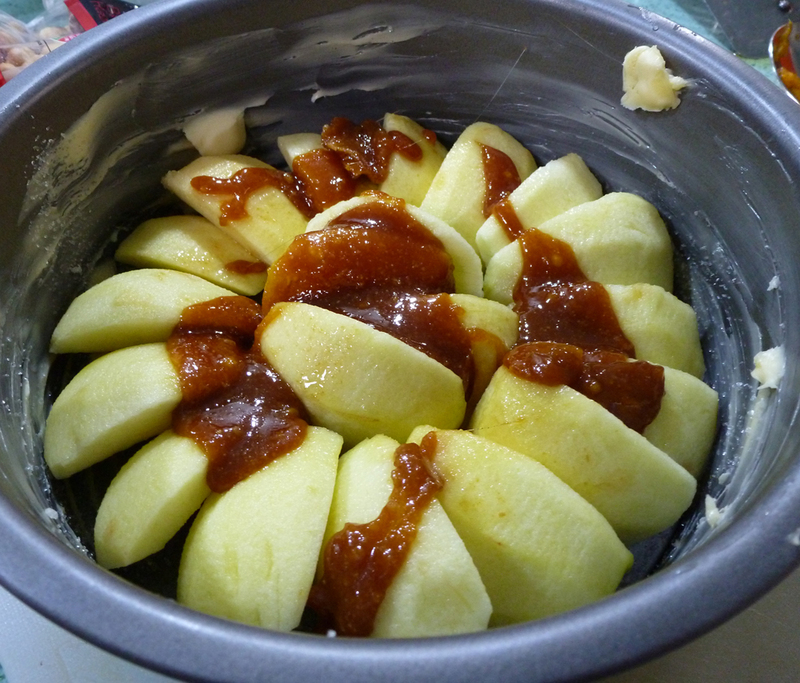 Apples draped with caramel, ready for the cake mixture to go in. Beat in the eggs in one at a time. Fold the flour in gently. Check that the mix is a ‘soft dropping consistency’, and add milk if necessary. 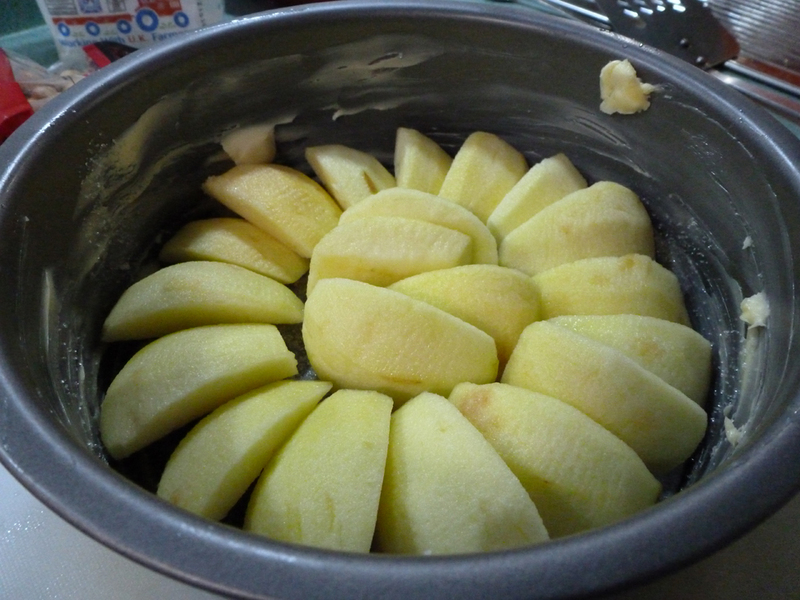 Top the apples in the tin with the mixture, and cook in a moderate oven (180°C) for 50 minutes to 1 hour. Allow to cool for 10 mins, then turn out onto a plate. It should be good! I plan to try this one. It looks delicious. Thanks.